SINCE 2001 more than 10,000 people have been joining the agricultural labour force of India each day. As a result, the country’s 30 per cent working population, 144.3 million, is agricultural labour, which works on farms. 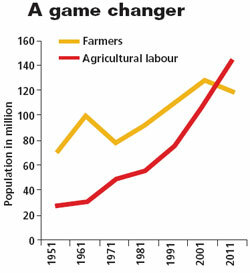 The number of farmers has dipped from 127.3 million in 2001 to 118.7 million in 2011. The figures are from the latest report of Census of India. While presenting the report, Census commissioner C Chandramouli said fall in size of land holdings over time was responsible for the 3.5 per cent rise in landless labour over the past 10 years. The report rings alarm bells since the agriculture sector is struggling to provide jobs. 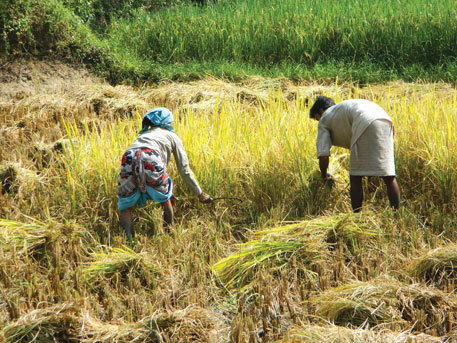 Andhra Pradesh and Chhattisgarh have seen a significant rise in agricultural labour in the past two decades. Both the states have over 45 per cent of their worker population engaged in agriculture labour. Number of farmers in the country decreased by over 8.6 million in the past one decade. The decline is for the second time since Independence; in 1971-80 around 20 million farmers had left farming. Only 54.6 per cent of total workers in India are now part of the agriculture sector—a decline of 3.6 per cent from 2001. Madhya Pradesh, Uttar Pradesh, Chhattisgarh, Jharkhand and Assam have witnessed a decline from 45 per cent and above of workers’ population in 1991 to 25-35 per cent in 2011. The 2011 Census brought good news for Rajasthan, Himachal Pradesh, Arunachal Pradesh, Nagaland and Mizoram where the number of cultivators has been over 45 per cent and above since 1991. If agriculture is such a nonviable preposition then what is forcing people to join the labour brigade? Displacement is the foremost reason, says Jayati Ghosh, professor of economics at Jawaharlal Nehru University in Delhi. “Due to increase in urbanisation and industrial projects, land resources are getting depleted and people are becoming landless. These people, who have been practising farming for generations, do not know any other skill. The primary job they can do is work on others’ land,” she says. Another reason is big sectors like manufacturing are not generating jobs to absorb labour from the agricultural sector. “Most of the employment today is coming from the construction sector,” adds Ghosh. Ghosh says concentration of land in the hands of a few has also resulted in the rise in agricultural labour. “They rent land or employ people to work on their farms. This trend has resulted in fall in the number of farmers.” Migration could also be a reason but it is difficult to affirm since the Census data does not capture seasonal movement of people, say economists. “There is an urgent need for intervention through assured income to farmers and better prices for agricultural commodity,” says Kuruganti.